From emergency equipment to consumer electronics, these batteries are Trusted EverywhereTM. 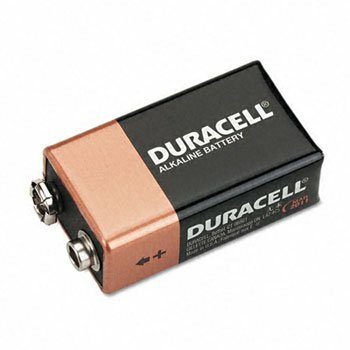 Duracell® Coppertops have a 40+ year history of delivering reliable, long lasting, portable power. Each battery features an enhanced secure seal for safe, leakage and corrosion free operation. For your needs, choose high-performance batteries manufactured by the worldwide industry leader. Date coded for added convenience. Seven year shelf-life. Global Product Type: Batteries-Alkaline; Battery Type: Alkaline; Battery Size: 9V; For Use With: Everyday Electronic Devices. If you have any questions about this product by DURCEL, contact us by completing and submitting the form below. If you are looking for a specif part number, please include it with your message.